I just keep coming back for more! There have been three UXLibs conferences so far (clue is in the name!) and I’ve been to all of them. For me, there’s no other event, let alone conference, that I’ve been to where I meet so many interesting people from so many different countries. It’s brilliant! And in one sense, as fantastic as the keynotes, delegate presentations, workshops, team challenge are, the international feel to this event brings it to life. It adds something extra. When I think of UXLibs, in addition to UX, I always think of the people I’ve met and the UX stories I’ve heard from all over the world. The conference this year was in Glasgow, yet again utilising the creative space(s) provided by the studio. (If you need somewhere for an afternoon, a day or two, then try these guys!) The space and structure of the conference was great! Much like the previous two years, the regular coffee intervals and plenty of break-out areas all add to the conference dynamic, creating a relaxed, informal setup which allows you to move about the whole space quite freely. In opening the conference, Andy Priestner gave a bit of context and set the scene for the event which I think was helpful both for those of us that have been to UXLibs before and any first-timers, of which there were many! The first UXLibs in 2015, was, for many, the first time we’d looked in detail at UX principles and techniques or certainly in the context of libraries. At UXLibs II last year, we looked at advocacy of UX in our institutional context, how can we get those in senior management, colleagues and students on board. 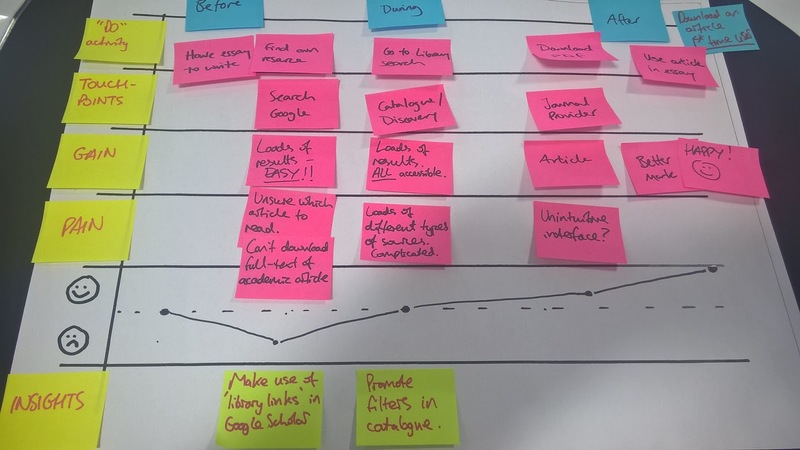 This year Andy got us to consider UX maturity in libraries and reflect where we are on that journey by introducing his new model of UX Adoption in Libraries. This model looks at the success or not of UX adoption at your institution. After a few years of using UX techniques in quite a few projects at York, I’d definitely say we’re moving in the SUCCESSFUL direction. More and more of our internal groups and projects are keen to use UX techniques in the Library after being made aware of the quality data we’ve been getting and positive changes we’ve been making on the back of it. The challenge I take from this model is to keep progressing - to make UX business-as-usual and part of all that we do, whether it’s projects or the day-to-day activities. Experience map from 'Experience Mapping' workshop with Anneli Friberg & Anna Kågedal. For me, a big takeaway from the conference this year was around values, principles and social responsibility. In their keynotes, Matthew Reidsma (Grand Valley State University Libraries) and Meredith Evans (Jimmy Carter Library and Museum in Atlanta) both talked about this in relation to their roles and projects they’ve been involved with. I like to think of myself as a values kind of person, someone who thinks more than simply about the surface-level interaction with a user. However, both Matthew and Meredith's talks showed me that I probably don’t! Values and social responsibilities aren’t things that just happen, you need to be purposeful and deliberate about them. You need to talk about them with each other and if you have them remind each other of them. Matthew posed questions such as ‘If our tools only work on the newest technology, what are our values?’ If we are attracted to the bright shiny new thing more than helping, assisting and empowering all our users do what they need to do, then we’ve got things the wrong way round. As best we can, we need to make sure our services are accessible to all, whether they are on a £1,500 laptop or a £300 one. Sometimes it’s unavoidable, there comes a point when folks have to upgrade, however we should not assume everyone has the latest device. In relation to our Library Catalogue, Matthew asked us ‘What is (our) relevance ranking? Is it about satisfaction?’ The relevance ranking is often controlled by Library vendors, but this got me thinking, perhaps it’s something we should be scrutinising a bit more? Matthew reminded us that behind every algorithm is a human and therefore, despite our best efforts, bias will be in the design. How many other areas of the library are affected by our biases? All of it probably! Matthew concluded his talk by defining the Library as people and thus our mission is to help people. So in order to do this we need to keep in mind the full humanity of people we design for, always ask if your design is going to limit or create choices for those who use design. Meredith talked about the Documenting Ferguson project - a collaborative, community-driven digital repository to preserve both local and national history surrounding the police killing of teenager Michael Brown on August 9, 2014. Meredith’s talk focussed on social responsibility and community archiving. She explained that these kind of collections tend to be built without the input of the people represented in the collection but instead the faculty and donors. The goal of the project was to make sure that a diverse range of perspectives and core communities related to the event was represented in the collection. To make sure the communities involved were represented in Documenting Ferguson the project team made a way for original documents to be uploaded to a website. This seemed really innovative to me - a great way to capture different types of media in a relatively straightforward way. The project had no money either so Documenting Ferguson was done using open source software (Omeka). This kind of approach, however, began raising some interesting ethical questions, questions that had not really been considered before. Did the people who tweet give consent to their tweet being archived? How should they deal with this? Meredith passed on a helpful practical tip that came out of this project - she often did things without the support of senior leadership for various reasons, however she got their support it in the end and ultimately, the project was a hugely rewarding achievement for all involved. Meredith concluded her talk by challenging us to listen to your users and not necessarily your administration. Shake it up, be open to change and try something new. Social responsibility can be implemented by strategic vision and specifically, community archives have ability to alter public understanding of events if they do something like this. By making sure they represent the people involved. The final big takeaway for me from UXLibs III was around personas. At York, over the last few months, a few of us have been trying to come up with Customer Profiles particularly for different customer groups however, after receiving some feedback from an academic at York (UX expert), we've subsequently shifted our thinking to personas. He explained to us that personas are best when developed from UX and other sources of data, which we have lots of, so we plan to develop these over the next year. Despite this feedback, I shared our customer profiles during the UXLabs session on the first day as I was really keen to get some input and advice from others at the conference who might have some experience in the area of personas. Deidre Costello (EBSCO) recommended a fascinating read by Indi Young which provided me with loads of things to think about regarding personas. Like others, Indi believes that creating and making use of personas enables staff to develop empathy for their users. Indi also feels that creating personas is easier than you think however, make sure you slow down and try to understand what’s beneath a person's statement or question rather than try to solve problems immediately. You cannot collect this information via survey but rather more open techniques. Indi’s post provides some really useful tips for when you design personas. Writing descriptions of the Persona in the first person can help however Indi argues that generally, including demographic information in your personas can distract and limit your creativity when considering your users however there are times when they may be essential (for context). They can probably be removed by default. I also found it interesting that, in Indi’s experience, the names and descriptions of personas can trigger anti-empathy so it’s best, if possible, to do this in a way which aligns with how staff would describe themselves. Eg. The Frustrated is better than The Grumbler. I also had a great conversation with Lauren Ray from the University of Washington (UW) during UXLabs. Lauren explained to me that UW created Libraries Patron Personas in 2009 as a tool to initially support website design however since then, these personas and other tools have been used to facilitate a variety of design work and brainstorming activities, as well as provide a useful framework for discussing how customers use the library. This is how UW broke down their Libraries Patron Personas: Brooke the Beginner: undergraduate student (66% of student makeup), Paul the Professional: professional online student (3.6%), Richard the Researcher: graduate student (22.4%), Sharon the Scholar: faculty (7.7%) and Vincent the Visitor: alumnus. UW thinks of their personas as archetypal library patrons and are meant to be used as a tool for framing their services and information to ensure they are user-centered and evidenced-based. In 2013, the personas were updated: the format simplified, statements were validated by more recent research, and the scope broadened to facilitate use beyond just designing for the web, but for use in a variety of design thinking scenarios to improve web content, library space, library services, outreach, and communication. Lauren informed me that UW are currently in the process of updating these personas again, they definitely see personas as a continuously developing thing something that you need to be prepared to regularly look at and reflect if they still match your user groups.